Number of educational institutions included in the Eco-Schools program in Slovenia is constantly growing. 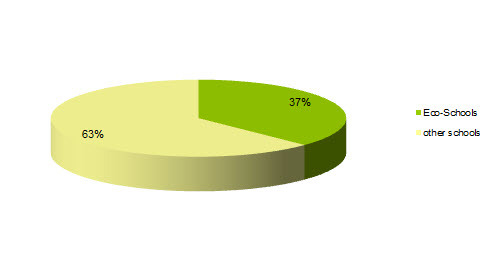 In the school year 2013/14 there were 717 eco-schools, representing about 40% of all schools in Slovenia. Thus, through environmental projects almost 132,000 kids and 15,950 teachers cooperate in the system of environmental education. Internationally, the program Eco-Schools at the end of the school year 2013/14, included more than 45,000 establishments, of which more than 16,000 had also sign of a green flag. According to the latest figures eco-schools globally bring together more than 20 million children and over 900,000 teachers. This way eco-schools link together more than 6,000 local communities worldwide. Doves, 2014; Statistical Yearbook 2013, Statistical Office of the RS. 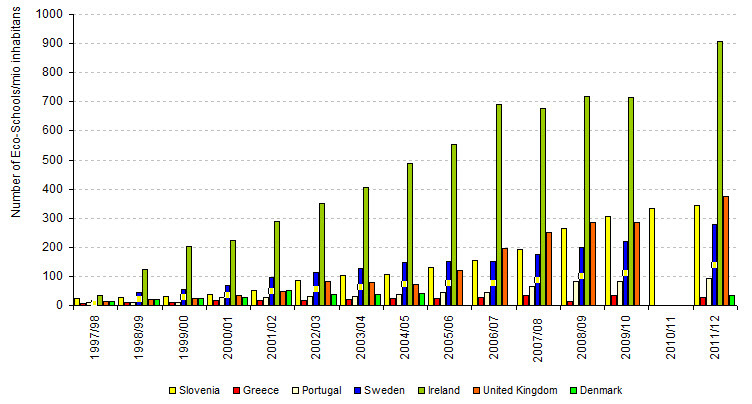 Doves, 2010; Fundation on Environmental Education, 2011; Eurostat, 2011. (data owner) data from table are not checked and for this reason less accurate.